PIGEON FORGE, Tenn. (June 18, 2018) — Pigeon Forge Path to Fame Talent Competition hosted its final round at Smoky Mountain Opry on Saturday, June 16, where 12 contestants performed. Taylor Deaton, from Springboro, Ohio, advanced to the top three. Deaton showcased her powerful vocals on a rendition of Kelly Clarkson’s “Piece by Piece.” She returned to the stage to perform “I’m The Only One” by Melissa Etheridge in the final round. View performance here. While Deaton didn’t claim the competition’s grand prize, she did gain a fiancé in Pigeon Forge. Surprising her on stage, Deaton’s boyfriend, Zack Fogelman, also from Springboro, proposed and the couple is now engaged. Each contestant performed in front of a live audience and a diverse panel of judges: John Alexander, Nashville-based talent executive; Michael Headla, general manager, producer and director of Smoky Mountain Opry; Jeff Taylor, general manager for Country Tonite Theatre; and Kyle Grainger, WVLT reporter. The top three finalists include the duo, Ashley Tragler and Christian Simcox from Bristol, Tenn., and grand champion Brenna Beatty from Springfield, Tenn.
Link to photos and b-roll of PathToFameFinals. Cross-state drive to first audition proves a wise decision for Ashley Tragler and Christian Simcox. PIGEON FORGE, Tenn. (June 18, 2018) — Pigeon Forge Path to Fame Talent Competition hosted its final round at Smoky Mountain Opry on Saturday, June 16, where 12 contestants performed. Ashley Tragler and Christian Simcox, from Bristol, Tenn., advanced to the top three. 19-year-old Tragler and 21-year-old Simcox are a duo on stage and in life. The couple performed “Poison and Wine” by The Civil Wars and won over the judges with their harmonies and Simcox’s impressive guitar skills. Tragler and Simcox left Bristol, Tenn. at 3 a.m. to audition in Nashville, Tenn. on April 21. View performance here. “Even if we didn’t make it at the auditions, even if we didn’t place in the top three, we just love playing music. That’s why we are here,” said Simcox. Approximately 450 contestants registered to compete in the Pigeon Forge Path to Fame. A three-month auditions tour visited Cincinnati, Nashville and Atlanta and produced four finalists from each city, all of whom competed in Saturday’s finals. Contestants competed for a grand prize package that includes a 12-month career mentorship with a Nashville-based entertainment executive and a consultation with performer Kelsea Ballerini. Each contestant performed in front of a live audience and a diverse panel of judges: John Alexander, Nashville-based talent executive, Michael Headla, general manager, producer and director of Smoky Mountain Opry, Jeff Taylor, general manager for Country Tonite Theatre; and Kyle Grainger, WVLT reporter. The top three finalists include Taylor Deaton from Springboro, Ohio, and grand champion Brenna Beatty from Springfield, Tenn.
PIGEON FORGE, Tenn., Feb. 9, 2018 – “Magic Beyond Belief™” starring internationally acclaimed magician Darren Romeo will reopen for a fourth season on Feb. 16, 2018, after being closed for a four-month production hiatus. This newly revamped Fee/Hedrick Family Entertainment show will resume back in the The Smoky Mountain Opry™ Theater in Pigeon Forge six days-a-week. The magical show will include approximately $250,000 in upgrades, most of which are in production elements. The move back to the Smoky Mountain Opry™ is to enable Romeo to perform larger illusions on a bigger stage and allows for the return of large animals to the show. “Our Magic Beyond Belief show starring Darren Romeo is bigger, better and brighter this year,” said David Fee, president and chief executive officer of Fee/Hedrick Family Entertainment Group. “We have a considerable bigger stage in a larger theater, but the show is still a very intimate experience. This year’s show will be more family friendly and we have some new elements in the show including a live magical unicorn and a mermaid who swims among coral reefs and a sunken pirate ship. We also have the return of our serval cat and our amazing beloved white tiger named Hollywood. “We have more vibrant colors in new lavish sets and costumes, improved state-of-the art mood-setting lighting and fantastic visuals throughout the entire production,” Fee said. “It is a higher energy show with spectacular effects. “We are also installing a whole new sound system including a new sound board to enhance the audio quality in the theater,” Fee said. “Two large video screens will complement the show, as well as engaging music.” Fee says the show will leave the entire family spellbound. Romeo, the first and only protégé of Master Magicians Siegfried and Roy, will pay tribute this season to those who inspired him: Bobby Darin (for whom he was named), Harry Houdini, Harry Blackstone Jr., Siegfried and Roy, famed American ringmaster P.T. Barnum, and many great military heroes. He will also showcase arrangements from his favorite Broadway melodies. This full, two-hour “Magic Beyond Belief™” starring Darren Romeo production will feature stunning illusions, mind-boggling special effects, hilarious comedy, and vocal performance. Romeo will do some new parody celebrity impersonations this year including Darius Rucker, Lady Gaga and Dolly Parton. Romeo will appear Tuesday through Sunday, February through December, at The Smoky Mountain Opry™ Theater. 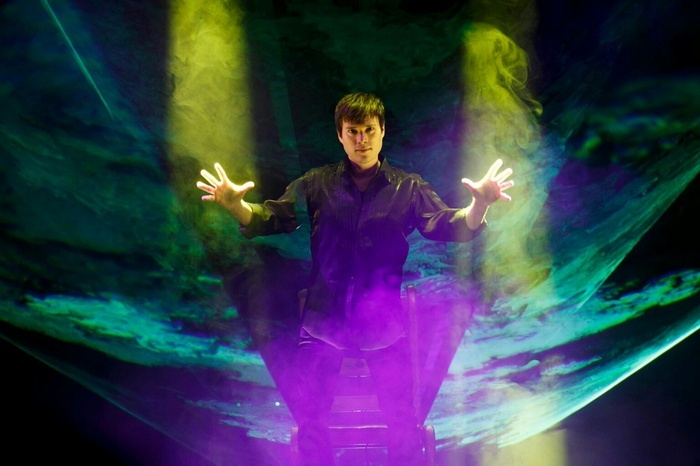 Romeo’s “Magic Beyond Belief™” starring Darren Romeo is known for his combination of live singing with the art of magic and illusion for a one-of-a-kind magical performance. “Magic Beyond Belief™” at the Smoky Mountain Opry™ Theater is performed this season in the 8 p.m. evening time slot until Friday, March 2 when the Smoky Mountain Opry™ “Feel The Music” Show Opens. After that the magic show will be performed in the afternoon matinee slot at 3:00 p.m. on Sunday, Tuesday, Thursday, Friday and Saturday. It will also be performed at 10:30 a.m. on Wednesday. The theater is located at traffic light 0 at 2046 Parkway in Pigeon Forge. Ticket prices are $34.95 plus tax for adults and $9.95 plus tax for children ages 3-11. Children under 3 are free. For more information or reservations call the theater’s box office (865) 428-7469 or 1-800-768-1170 or visit www.pigeonforgemagic.com. In addition to all of the large illusions people would expect to see on stage from Siegfried and Roy’s protégé, Romeo will also perform close-up magic and sleight of hand tricks in the new show. Romeo will carry on Harry Blackstone Jr.’s legacy by performing his famous “Floating Light Bulb” Illusion. He is the only magician in the world granted permission from the Blackstone family to perform this tribute. Pigeon Forge, Tenn., March 28, 2016– “Magic Beyond Belief™” starring Darren Romeo has begun its second season of magical entertainment complete with thrills, surprises and exotic animals at the Smoky Mountain Opry™ Theater in Pigeon Forge, Tenn. Romeo, a magician and a singer, stars in a critically acclaimed, full-scale production magic show that features white tigers, large-scale original illusions, vocal performances, celebrity impersonations, comedy and a huge tribute to the magicians who inspired him the most: Siegfried and Roy and Harry Blackstone Jr.
“This year there are some new and fun elements added to an already incredible one-of-a-kind illusion show,” said David Fee, president and chief executive officer of The Fee/Hedrick Family Entertainment Group. “We hope you will join Darren as he ‘Talks to the Animals’ combining puppetry designed by Michael Curry (of Broadway’s ‘The Lion King) and the incredible magic from Siegfried & Roy’s Las Vegas show. The hilarious ‘Tiger Tails’ segment that Siegfried and Roy gave Darren contains puppet tails that come to life, dancing around the stage, all the while interacting, talking and singing with Darren. This new addition is definitely sure to be a treat for kids of all ages! “There is also a new magical piece celebrating ‘Heroes’ that has been added to the show,” Fee said. “We all have heroes. When we are children, we have heroes, and as we grow older, our definition of heroes changes. In a beautiful, magical, musical, multimedia tribute to heroes of all kinds, Darren introduces a rare Frank Sinatra song with an entirely new and modern twist. This is the don’t miss show of 2016! The first and only protégé of world-renowned magicians Siegfried & Roy, Romeo appears six days-a-week March through October at The Smoky Mountain Opry™ Theater. Romeo’s “Magic Beyond Belief™” is known for his combination of live singing with the art of magic and illusion for a one-of-a-kind magical performance. He previously performed in his own show as “Siegfried & Roy presents, Darren Romeo” at the Mirage Resort Hotel and Casino in Las Vegas and all over the world. He has also performed at Caesar’s Palace and the Flamingo Hilton in Las Vegas, at the world famous Magic Castle in Hollywood, Calif., and other venues such as the Eldorado Resort Casino in Reno, Nev., Beau Rivage Resort and Casino in Biloxi, Miss. ; and Bally’s Atlantic City Hotel and Casino, (N.J.). Darren Romeo in “Magic Beyond Belief™” is performed in the afternoon matinee slot at The Smoky Mountain Opry™ Theater at 3:00 p.m. on Monday, Tuesday, Thursday, Friday, Saturday and Sunday. Tickets for the show are $29.95, plus tax each, and children 3 to 11 and under are only $9.95 plus tax. Children under 3 years old are free. The 1400 seat theater is located at 2046 Parkway in Pigeon Forge. For more information call the theater’s box office (865) 428-7469 or 1-800-768-1170 or visit pigeonforgemagic.com.